The way you make customers feel in the first few days after they’ve signed up for your site or service can influence their level of engagement with your company long-term. This moment of first impression is a crucial moment. In this tutorial, we’ll walk you through creating your welcome email in Customer.io (and also assumes that you've completed your integration). Most of the time, you’ll want to send your welcome series to all new users who sign up for your product or service. In Customer.io, this takes a few simple steps. By default, you’ll have a segment in your account called “Signed Up”, which includes all users with a created_at timestamp attribute. Check out this segment by heading to Segments in the navigation. Make sure the rule is looking for the attribute created_at is a timestamp and then hit Save Changes. ☛ The timestamp you send to Customer.io should be a Unix style timestamp. Don’t have a created_at attribute or it's not in the right format? Reach out to support. Now for the campaign! In the navigation, click Triggered, followed by Create Campaign. After naming your welcome campaign, click Create Segment Triggered Campaign. Click Add segment condition and find the Signed Up Segment. Give that email a name that makes its welcoming purpose clear. (This doesn't have to be your email’s subject line.) Your email will then appear in your workflow. Click Add Content in the side panel to start writing your content! In our composer, you can fill in your message content, choose your email layout, and other details like sending address. Our composer also has powerful tools you can use to personalize each email. You can use Liquid tags to add a customer’s name and otherwise tailor the content. In our example, we added our customer's first name and plan details. Tip! Don't know what to say? We've got you covered. Here are some welcome copy templates you can adapt and use. Let's set this email to Queue Draft so that we can double-check if the campaign is set up correctly. That means, once the campaign starts, the welcome emails will be generated in real time but not send until you approve them. Otherwise, if you want the email to send right away, select Send Automatically. Depending on your vision for your new customer experience, you may want to send your first welcome email right away, or give people some time to explore your product before you send your first message. If you don't want to add a delay, that's it! Move onto the next step. Next, you can set a conversion goal if you like. That means if there's an action you're hoping the new user will take after reading your message, you can track that. Customer.io's conversion-tracking works by marking people as converted when they enter or leave a specific segment. You can learn more about conversion-tracking here. If you don't want to set a conversion goal, be sure to click "Skip goal". Almost there! Review your welcome campaign and check to see if there are any errors or anything missing. Before you start your campaign, you can choose to either send your campaign to all people who ever signed up, or just new users who are signing up after the welcome campaign starts. For welcome messages, you probably want to choose to send to *Future matches only. Otherwise people who already exist in your system and signed up in the past will suddently get a random welcome email once you set your campaign live. Finally, click Start Campaign, and that’s it! 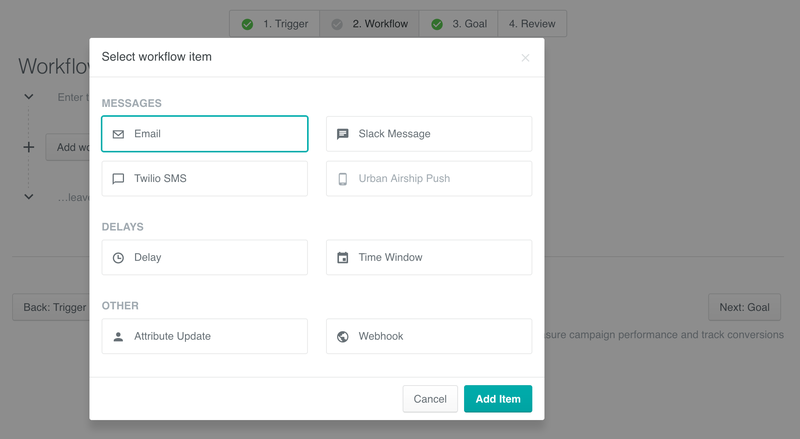 If you’ve set your email’s sending behavior to draft to check how your campaign will run, remember you’ll have to set to “Send Automatically” to reach your customers. Once emails start sending, you can head to the campaign’s overview page to see how the campaign is performing. We’ve covered a welcome campaign that is email-based, but there are many more ways that you can reach out to customers in their first few days after signing up. You may want to include a combination of emails, SMS, Slack notifications, or all of the above in your series. Welcome emails are a win-win for both your company and your customers. If you have any questions about how to set up a welcome email series, please get in touch!